Very reasonably priced accommodation. Nestled amongst trees in a residential neighbourhood just off the main West End beach road. 5 minutes walk to everything, no need for a car. Safe neighbourhood. This is central West End, just 400 yards from Splash Inn, no long walks to the beach or the nightlife. Read the reviews, the photos don't do the house justice. This rental is much more spacious than most and very well equipped. All linens are 100% cotton and towels are provided. Contact me for specials or with any questions. 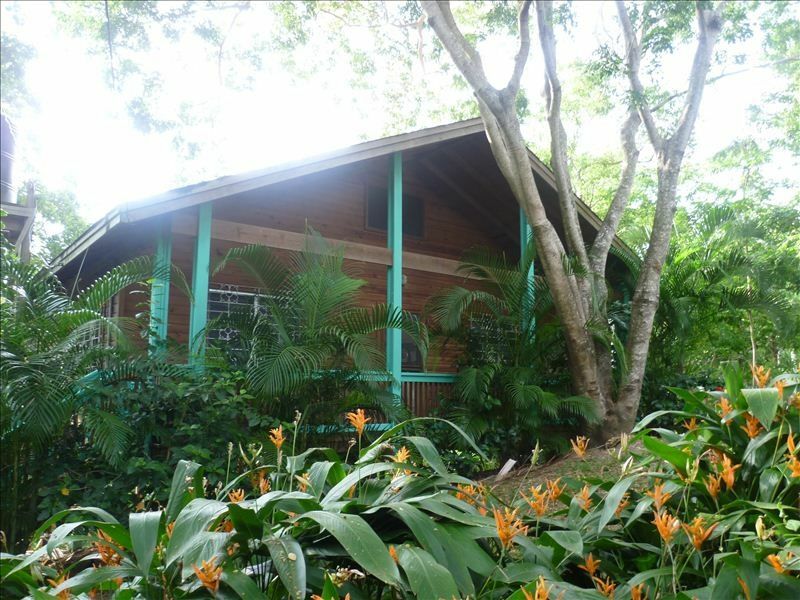 Just a few minutes walk from the center of West End, Mi Casa is a spacious two bedroom wooden house. Most affordable house of its size in the area. Tastefully decorated with fully equipped kitchen, large, airy living area with cable tv and spacious covered balcony with hammocks. Perfect for relaxing after a days diving. Set back from the action in a residential neighborhood but with all the bars, shops, dive shops and grocery stores within easy reach. 2 double bedrooms, with additional sleeping on a sofa bed in the master bedroom(could be moved if required) and a single bed in the living area (could also be moved to the second bedroom). For a truly relaxing getaway come to Mi Casa. Special deals are available on request. Maid service can be provided at an extra cost. This is a family home not a vacation rental, so it is more spacious than most. Set in a 'real' neighbourhood amongst wonderful people, just a short stroll from the action but set back enough to relax. A small pay as you go phone to keep in contact with the property manager. Gas stove and oven, fridge, microwave, toaster, coffee maker. Lots of pots and pans, all you need in a home from home. Large balcony at back of house (10ft x 30ft) with hammocks and breezes! Small front balcony. Perfect vacation in the best location in Roatan ! In the world of real estate, there is a three word phrase that has been coined, 'Location, Location, Location'. Well, I do, also, believe this phrase should be used to describe a great vacation at this lovely house. Four of us stay stayed at this gem during a week and we had an amazing time dhere. The house is located very near snorkeling sites, restaurants, bars and a grocery and liquor store. This home was perfect for the four of us, although two more friends could have joined us. Somedays, after returning from snorkeling, we slept during the afternoon in the house's back porch hammocks while enjoying Roatan's fresh Caribbean Sea breeze. During our stay here, we prepared most of our meals in the kitchen's house. We bought almost all of our groceries at Eldon's Supermarket in Coxen Hole, located on our way from the airport to the apartment. We purchased our depleted groceries in Woody's grocery which is located within a walking distance from the apartment. Also, we bought some liquor there. One night, we had dinner at Thai Place, a very good Thai food restaurant. The fried rice served here reminded me the Benihana's fried rice ! Since, I usually wake up very early in the mornings, some days, I went to a coffee place to get my cappuccino. During nights, we visited these bars & discos: Sundowners Beach Bar. This is where would want to start the night. The crowd starts here and moves on to the other bars as the night progresses. Between 6pm and 8pm is a great time to be there, but usually the close around 9pm. Live like a local and grab a Monkey La La or two, Roatan’s signature cocktail. The Blue Marlin. Karaoke night is especially active on Thursday night. It usually starts around 8pm and goes until midnight and the crowd is into it the entire time. If you plan to sign, make sure you add your name to Karaoke list early! Nova. A good late night spot. DJ and good dancing most nights. It’s small, but probably the busiest place late at night. Music is usually of the dance/techno, but there is some variety as well. Frank’s Cigar Bar. If dancing isn’t your thing, and you’d rather relax, smoke and have a beer than Frank’s Cigar Bar is your best bet! Booty Bar. Full dance floor on the weekends with a great variety of music. Finally, thank you Samantha for allowing us stay at your beautiful house and Tanja for taking care of all our needs during our stay. Definitely, we're already planning in returning to Roatan and staying at this lovely house again ! Thanks for taking the time to write a review. I'm so glad you enjoyed your stay, we hope to welcome you back soon. a friend my mother and I stayed at mi case for a week. It was lovely. The house has a nice cachet to it, it is close to west end but quiet. The roosters do scream early in the morning, but they are all over the island. The kitchen is fully equipped, which is very nice, we ended up saving a lot of money by cooking at home. It is a very safe area but we still hid our belongings when we left. The rooms a nice and the beds are comfortable. We loved our stay! We just finished our wonderful stay at Mi Casa and are missing it already. We loved how close we were to all the attractions yet able to enjoy peace and quiet. Travelling as a family we especially appreciated the affordable price and use of the washing machine. Thanks also goes to Tanya for getting us settled and making us feel at home. I stayed at Mi Casa for about a month in April 2013. It was very close to the main strip in West End but far enough away to enjoy some peace and quite. The house was very clean and a GREAT value. I hope to be back regularly. This was the second year that family members have stayed at Mi Casa. This was so delightful, close enough to the attractions on West End, yet far enough away that you rarely heard anything (except the roosters). My communications with both the owner and the site manager were great! They did as much as they could to answer our questions and to make our visit great. It was great having a kitchen to cook in (although the oven temp was in C rather than the F). We paid extra to have the house cleaned mid-week (we were on vacation after all). We did rent a car this time (to explore the island) and you should know that the road up to the house is a bit rough and (of course) not paved. It's a short walk to town to some great restaurants and bars. The dive shops and snorkel areas are fantastic (Tyll's/Splash Inn). We drove into Coxen Hole to do our main grocery shopping at Eldons. The options for buying gluten free food were fantastic. Don't bother bringing that stuff (or any "health-foods") from home. We've made a lot of friends in the West End over the years we've been going there, so we'll be back. I'd gladly return tomorrow; but I have to wait until next year. Mi Casa served the needs for our group of 8. The owner and property manager were very pleasant and easy to work with. I did not feel misguided by any information that was provided by them or on the website, however, it was a little crammed with 8 people. I would definitely recommend staying here with a smaller group. Also, there was a broken part on the toilet for most of the week, which they were working to fix, but still left us with that minor inconvenience. The rest of the house was in good order, it was in a good location and we enjoyed our stay. The house has beds for 5 people. I am happy for more people to stay (it makes it cheaper) and either bring blow up beds or use the sofas, but it really is intended to be a 4 person house.